We’d love your help. Let us know what’s wrong with this preview of Vanessa Bell by Frances Spalding. To ask other readers questions about Vanessa Bell, please sign up. I purchased my copy of Spalding's biography during my visit to Charleston on May 4, 2016. Initially published in 1983, Spalding's study of Vanessa Bell's life and work was the first to be totally devoted to this hitherto "silent" member of the original Bloomsbury Group. Spalding does an admirable job of demonstrating that VB's personality and domestic gifts and strong individualistic sense was at the very core of the Bloomsbury Group. She was also perhaps the single most influential person in her sister Virginia Woolf's life, and a talented artist in her own right. This biography was reissued in 2016 - featuring Duncan Grant's Portrait of Vanessa Bell, painted in 1918, the year that VB gave birth to Angelica (Bell, later Garnett). In her preface to the new edition, Spalding refers to the interest in Bloomsbury (and specifically Vanessa Bell) generated by the BBC series "Life in Squares" - which aired in 2015. My daughter Camille and I watched this series in January of 2016, and I will happily acknowledge that it did reignite an interest in the Stephen sisters (VB and VW) which I've had for nearly 30 years. Prior to visiting Charleston, I reread Angelica Garnett's memoir Deceived with Kindness. I also read Jane Dunn's biography titled Vanessa Bell and Virginia Woolf: A Very Close Conspiracy alongside this book. Dunn's study focuses tightly on the relationship between the sisters, and how much of their personalities, choices and interests were influenced by their roles within their family. From the beginning, Vanessa was cast as a maternal figure. She was the eldest of the four children belonging to her mother and father, and after the early deaths of her mother and older step-sister, Vanessa had to take over the organisational reins of the household. All accounts of her life emphasise her talents in making a congenial home and binding people together. She had three significant romantic relationships in her life - Clive Bell (her husband), Roger Fry (an influential art critic and her lover for several years) and Duncan Grant (fellow artist and life partner). She somehow managed to maintain these relationships alongside each other, although Spalding (and indeed Dunn) emphasise that it was not without personal cost to herself. She also managed to run at least two homes and a variety of dependants while managing an art career. Vanessa Bell was at the centre of the Bloomsbury group and more than any of the others lived in squares and loved in a triangle. She also lived at Charleston Farm at the foot of the South Downs and visiting there pushed me to pick up this book. I was left with an enigma, a stoical woman whose love was returned but in very different measures and whose art I had overlooked. Frances Spalding has written a classical biography, easy to read, measured and balanced its views and following the chronology Vanessa Bell was at the centre of the Bloomsbury group and more than any of the others lived in squares and loved in a triangle. She also lived at Charleston Farm at the foot of the South Downs and visiting there pushed me to pick up this book. I was left with an enigma, a stoical woman whose love was returned but in very different measures and whose art I had overlooked. Frances Spalding has written a classical biography, easy to read, measured and balanced its views and following the chronology of the subject's life. Oh but I did not want to finish this but was unable to stop turning the pages as fast as I could. A wonderful, engaging read in every way. Spalding had a tremendous subject in Vanessa Bell and her research and delivery is impeccable. And now I sit here bereft and unsure as to what to read next. Also, I absolutely have to visit Charleston House and garden at some stage! A little on the dry side but Bell is an interesting enough person that you keep reading. Virginia Woolf's sister she married Clive Bell and had two kids and she had affairs and spent most of her life with the love of her life (whom she also had a child with who went on to marry one of her father's former lovers...), the gay artist Duncan Grant, while never divorcing her husband. I have read and re-read this portrait of Vanessa Bell. 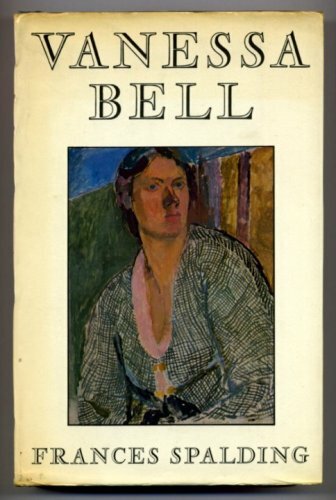 It is a fascinating study of Bell's family, including her sister Virginia Woolf, of the Bloomsbury group, and of the wonderful work done by the Omega Workshop-- the Arts and Crafts collective founded by Bell and her cohorts. It is biography at his best, full of details and deeply (and also emotionally, sorta) involved in the long life of a passionate woman and artist.